The televised presidential debates are the mega-events of the fall campaign. Stakes are high as the candidates face each other, across a single stage, within a month of the election, before a television audience of tens of millions of people. A debate can reveal the candidates' differences and ability to think on their feet or it can devolve into a scripted exercise bordering on a joint press conference or an exchange of soundbites. While derided by some as essentially exchanges of talking points, the fall presidential and vice presidential debates are seen as crucial to the candidates' success. This cycle there was a possibility that three candidates might be on the stage for the first time since 1992. Libertarian Gary Johnson looked like he might be able to meet the 15-percent polling threshhold (+); however on Sept. 16, the Commission on Presidential Debates announced that he had fallen short (+). All from 9:00-10:30 p.m. Eastern time without commercial breaks. the third presidential debate in Las Vegas drew 71.6 million viewers (compared to 59.2 million for the third debate in 2012). The Commission on Presidential Debates (CPD), a non-profit organization established in 1987, has organized all general election debates since 1988 (this is their eighth election cycle). Previous debates were sponsored by the League of Women Voters (1976, 1980, and 1984) and the networks (1960). The CPD develops the candidate selection criteria which are used to evaluate which candidates it will invite to participate. It proposes dates and locations of debates. It lines up corporate sponsors and oversees preparations for these important events. In each of the last four cycles the CPD has held three presidential debates and one vice presidential debate, with the vice presidential debate following the first presidential debate. The earliest debate has occurred on Sept. 25 and the latest on Oct. 22. The CPD debates have become very well established and although other organizations have put forth proposals for debates, none have come to fruition. Critics charge that the CPD is a bipartisan rather than a nonpartisan organization, and can scarcely be expected to be fair to third party and independent candidates. (The CPD is headed by co-chairs Frank J. Fahrenkopf, Jr. and Michael D. McCurry and a board of directors (+)). Critics also question the CPD's reliance on corporate money and maintain that it lacks transparency. Third party candidates have raised strong objections to their exclusion from the debates. They argue that the 15-percent threshhold is arbitrary and too high. Challenges to the Commission on Presidential Debates and its criteria have proven unsuccessful over the years, but there are several efforts underway this cycle to change the way things are done. In 2014, Level the Playing Field, the successor to Americans Elect, filed an administrative complaint and a petition for rulemaking with the FEC charging the FEC's 15-percent rule violates the law and proposing a new rule based on a signature drive competition among third party and independent candidates. Those candidates on the ballot in enough states to garner 270 electoral votes, would, as they seek to gain ballot access in the first part of 2016, compete to obtain the most signatures. (Level the Playing Field estimated that number at four million). This proposed rule would ensure the presence of one third party or independent candidate on the stage. Unlike many efforts to challenge the CPD, the "Change the Rule" campaign has the backing of many high profile individuals including Sen. Angus King (I-VT) and a number of former governors, Senators and congressmen (+). Additionally, Level the Playing Field and the Libertarian and Green parties filed a lawsuit charging that "the Commission on Presidential Debates, a private organization, formed by the chairs of the Democratic and Republican parties, unfairly and intentionally limits participation in the nationally-televised debates to the Democratic and Republican nominees -- placing other national party nominees at a severe and unjust disadvantage (1, 2)." The lawsuit [PDF] was filed against the FEC in the U.S. District Court for the Distriict of Columbia on June 22, 2015. Also on the legal front, Gary Johnson's Our America Initiative led work on a lawsuit filed Sept. 29, 2015 against the CPD challenging the exclusion of qualified candidates violates federal anti-trust laws as well as the First Amendment (+). Also of note, the Annenberg Working Group on Presidential Campaign Debate Reform considered a modest recommendation on third party participation, but could not reach a consensus for its June 2015 report. Legal activity by minor party candidates in 1996, 2000, 2004 and 2012 suggests any legal or legislative efforts face long odds. In Nov. 2001, Rep. Jesse Jackson Jr. (D-IL) introduced a resolution in Congress that sought to lower the threshhold for participation to 5-percent (H.C.R. 263) but it did not go anywhere. In 2004, Open Debates, a 501(c)(3) nonprofit "committed to reforming the presidential debate process," established a Citizens Debate Commission in an effort to replace the CPD. The Citizens Debate Commission proposed five presidential debates and one vice presidential debate, what it termed "real and transparent" presidential debates as opposed to "stilted and deceptive events proposed by the bipartisan Commission on Presidential Debates (CPD)." (August 16, 2004 letter) Open Debates took several other actions. On Feb. 14, 2004 Open Debates filed a complaint with the FEC alleging "that presidential debates sponsored by the CPD are controlled by the major parties in violation of FEC debate regulations." The Open Debates complaint sought to have "the FEC prohibit the CPD from staging future corporate-sponsored presidential debates." And on April 2004 Open Debates filed a complaint with the IRS in an attempt to revoke the tax status of the CPD. Given the lack of success of the various legal efforts it is not surprising that there was no noticeable legal activity in the 2008. In 2012 the campaign of Libertarian nominee Gary Johnson decided to have another go at it, employing a new argument in a Sept. 21 lawsuit charging the CPD with violating the Sherman Anti-Trust Act of 1890 (+). The Johnson campaign's effort failed. Green candidate Jill Stein weighed in with an Oct. 22 lawsuit charging that the CPD and others had "deprived her of her constitutional rights to due process, equal protection, and free speech, as well as her statutorily protected civil rights" (+). That too failed. Excluded candidates and their supporters are left with generally ineffectual protests. For example, Occupy the Debates (fb) sought to encourage an alternative conversation and activities. Each cycle the CPD tweaks its formats to try to improve the debates. For 2016 the report of the Annenberg Working Group on Presidential Campaign Debate Reform, released June 17, 2015, offered a number of recommendations "to improve the quality, reach and relevance of debates." This was a very significant report, with recommendations in three areas: expanding and enriching debate content; broadening the accessibility of the debates; and improving the transparency and accountability of the debate process. One of the most noteworthy proposals was to "eliminate on-site audiences for debates other than the town hall, and, in the process, reduce the need for major financial sponsors and audiences filled with donors." This was a direct challenge to the way the CPD has done business, and was not implemented. In past cycles there have been other tweaks. For the 2012 debates, seeking to focus more time on big issues, the CPD tried a new format in which the first and last debates were divided into six approximately 15-minute long segments or pods. Even critic George Farah of Open Debates stated that, "The Commission deserves praise for responding to its critics and advocating for more informative debate formats." However, he went on to outline "major problems" with the CPD debates (>). The 2008 formats featured looser time constraints. The format of a debate has a critical impact on nature of the exchanges that occur or do not occur and on the amount of information viewers are able to learn. The most obvious parameter to consider is who is on the stage and who is not, but there are many other factors. Is there a live audience and are they controlled or disruptive? Is the subject matter confined to one area, such as the economy, or is it more wide-ranging? What is the time limit on candidate responses and on rebuttals? Finally, who asks the questions? The 1960 and 1976-1988 presidential debates exclusively used the panel of reporters. More recently the single moderator and town hall formats have come into favor. The town hall format was first used in the Richmond, VA debate in 1992. Having an audience of undecided voters pose the questions likely results in a broader range of questions, but on the downside this format does not foster follow-up. One format which has not been attempted is to have the candidates question each other directly. The Annenberg report recommends increasing direct candidate exchanges, as well as using "alternate formats for some of the debates, including a chess clock model that gives each candidate an equal amount of time to draw upon." Former House Speaker Newt Gingrich has challenged the substantiveness of the CPD-sponsored debates. In an appearance in Des Moines, Iowa on Aug. 12, 2005 he called for an end to the current tightly formated presidential debates saying they "trivialize the whole process." Instead, Gingrich said, the candidates should engage in a straightforward dialogue without a moderator for 90 minutes. During a "Lincoln at Cooper Union" dialogue held on Feb. 28, 2007, Gingrich stated "I propose that we challenge every candidate in both parties to make a commitment before the nominating process begins that if they become the nominee they will agree from Labor Day to the election to nine 90 minute dialogues, one a week for nine weeks..."
Another critic, Ralph Nader, has argued that 21 presidential debates should be held, organized by communities around the country. "Instead of the present, stifling, programmed three debates by the CPD, these twenty one debates would throw aside many of the taboos, bring the people into the process, address regional needs, excite larger voter turnout and compel the candidates to be better, more forthright candidates," —Ralph Nader (+). While it is nice to contemplate the idea of a series of dialogues or thoughtful discussions of issues, such debates are unlikely to ever occur because, the candidates and their campaigns have the final word on formats and the risk of participating in a free-ranging series of events in the closing months of the campaign is too great. There is no requirement that presidential candidates participate in debates, but it would be quite damaging to be seen as avoiding or blocking the debates, particularly since the candidates have, at least until recently, taken federal funds. When it comes to the number, timing and formats of the debates, as well as who will participate, there is a lot of discussion, but invariably the major party candidates and their campaigns have the final word. The CPD proposal is on the table and serves as a starting point, but each campaign acts in its own best interest. The goal is to create the most favorable possible set of circumstances for their candidate. (The memoranda of understanding from two of the debates that have come to light show the minute details involved: 2004 [PDF] and via Time magazine's Mark Halperin 2012 (>)). In recent cycles the debate negiotiations have occurred quietly and without fanfare. In 2008 the Obama and McCain campaigns reached an agreement quickly and without posturing. In 2012 the campaigns again carried out their negotiations out of the spotlight (+). The same occurred in 2016; Marc Elias for Clinton and Dan McGahn for Trump headed negotiations that made no news. In past cycles, however, there had been ritual debates over the debates. For several weeks the two major campaigns jockeyed back and forth haggling over details big and small—everything from the number and format of the debates to the podium height and shape and who is or is not acceptable as a moderator. Closed-doors meetings alternated with pointed public pronouncements, but eventually the two sides reached an accord. In the lead up to the debates, the candidates undergo intensive preparations. Briefing books are put together, and the candidates engage in mock debates. Media accounts sometimes provide glimpses of these rehearsals. This cycle there was a marked contrast between the two candidates' approaches, as Clinton made intensive preparations, including staying off the campaign trail for days in advance of the encounters, while Trump did much less prep and continued to hold rallies. There are also efforts to set expectations. In the background, the campaigns' and the parties' rapid response efforts ramp up and issue various communications to set the stage as well as prebuttals rebutting points that they expect to be made. Closer to the debate, the candidates may be seen engaging in public displays of confidence such as throwing a baseball, jogging, or giving a thumbs up. During the debate, citizens watching on television or the Internet form initial impressions of the candidates based on their claims, assertions, gaffes or awkward moments and body language. (People who listen on the radio may form very different impressions). An ongoing and vibrant discussion unfolds in the social media, as Tweets, Facebook postings and the like amplify key moments. Not all the claims and assertions are true. The social media and traditional media will bring misstatements to the fore, but some have argued that a fact checking role should be integrated into the debates as they proceed. In addition to its work organizing the debates, the CPD has also undertaken efforts to enhance the viewing experience. Starting in 1996, the CPD ran a Debate Watch program to encourage debate-watching groups around the country. For 2012 the CPD announced "The Voice Of..." internet initiative. The rapid response units go into high gear during and after a debate, working feverishly to produce rebuttals to various claims; these documents are e-mailed out throughout the evening. Following each debate occurs one of the most unique and fascinating scenes in American politics. Top campaign staff, campaign surrogates and party leaders gather in the media filing center and spin reporters, telling them what they have just seen. On opposite sides of the filing center chairs are set up for Democratic and for Republican partisans to do satellite interviews with local stations around the country. After the debate pundits and commentators weigh in. Spin soundbites form an integral part of post-debate coverage. Many media outlets assemble groups of undecided voters to watch debates and then interview participants for their reactions. The media also fulfills its fact-checking role. Several third party candidate debates typically occur. Although C-SPAN does cover some of these, they usually receive virtually no attention. Evan McMullin (I) sought without success to engage the Libertarian nominee Gary Johnson; Johnson, however, had been aiming for the big stage. One organization that has done work on third party debates is the Free and Equal Elections Foundation. Free and Equal organized the People's Presidential Debate, a two-hour forum at University of Colorado Boulder's Macky Auditorium on Oct. 25, 2016, but only three candidates participated: Darrell Castle (C), Rocky De La Fuente (I) and Gloria LaRiva (PSL). A more noteworthy forum brought Gary Johnson (L) and Jill Stein (G) together on The Tavis Smiley Show, taped live in Los Angeles on Oct. 31, 2016. By comparision in 2012 there were several debates involving the major third parties. 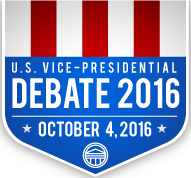 Free and Equal organized two debates. The first in Chicago on Oct. 23 brought together Gary Johnson, Virgil Goode, Jill Stein and Rocky Anderson (+); Johnson and Stein advanced to the second, in Washington, DC on Nov. 5 (+). Additionally, Ralph Nader hosted a third party candidate debate with the four candidates in Washington, DC on Nov. 4 (+). in June 2015 the Annenberg Working Group on Presidential Campaign Debate Reform released a 48-page report with recommendations "to improve the quality, reach and relevance of debates." Gary Johnson's Our America Initiative organized a "Coalition for Fair Debates. "i and led work on a lawsuit filed Sept. 29, 2015 against the CPD challenging the exclusion of qualified candidates violates federal anti-trust laws as well as the First Amendment. SOLIFICO, a pro-Johnson group challenged the 15% polling criterion in an Aug. 15, 2016 letter.